Srijan Midlands (SM) is an exclusive living zone in North Kolkata since the year 2012. Founded in the year 2009 by Srijan Realty Group. The Housing Complex is in a unique area that provides peaceful surroundings most of us crave for. It is located on Jessore Road which is very close to the Airport. Srijan Midlands is easily accessible from anywhere in the city. The complex is surrounded by lush greenery. Owing to its serene location; it gives you the true feeling of home away from the sound of honking vehicles and crowded streets of the city. Since, it is located near the airport the sky is lit in the night by the light coming from airplanes flying every now and then. So, sitting at your balcony and looking at the night sky, the airplanes give you an impression of fireflies flying in the sky. 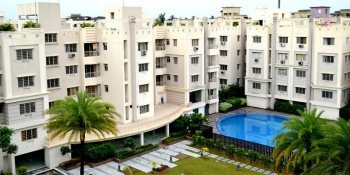 The complex has a total of 15 blocks comprising of 308 flats, dormitory, owner car parking areas and guest car parking areas. Land area is approximately 4 acres, and total super buildup is 3,35,224 sq.ft. It is often said that “All work no play makes Jack a dull boy”. Well, the scenario is quite different for the residents of Srijan Midlands. After a tiring day of work the residents can refresh themselves by accessing the AC Club House that contains Gym, Home Theatre, Library, Toddlers Zone and an Indoor Games room having various indoor games like Billiards, Table Tennis, Carrom and Chinese Checkers. It also has an outdoor multipurpose court , children park and a swimming pool. So these facilities will not only refresh your mind but will also help you stay agile and in shape in the long run throughout your life. Power Cuts are never an issue at Srijan Midlands as it has 24 hour power back up facility. Intercom Connection helps the residents stay connected at any moment of the day. So you do not need to travel to any of the flats to ask for anything as every resident is just a call away. 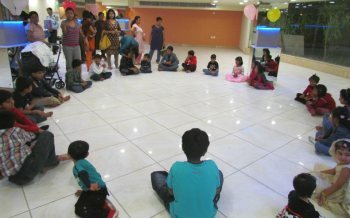 Family occasions can be organized in the Common Hall and hence the residents do not need to bear the pain of booking any hall outside of the complex. The entire complex is maintained by FM (Facility Management) and is under the supervision of Srijan Midlands flat owner association. The Association contains 14 directors from 14 blocks and the 15th block contains a Bungalow only. The FM has a total of 42 staffs. Srijan Midlands is not only about living a luxurious life but celebrating life king size. Various events bind together the residents in a strong bond of togetherness. The events focus mainly on human bonding through sports and cultural events. Different types of sports events and competitions namely Badminton, Table Tennis, Carrom and Short Arm Cricket are organized every year amongst the residents. Cultural events like recitation, singing and drama are also organized. Professional Singers are also invited to sing in these cultural events to entertain the residents. 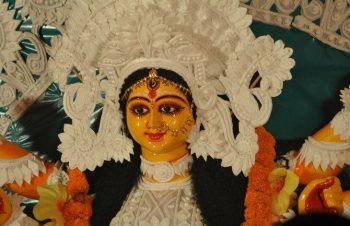 Each and every festival whether big or small like Durga Puja, Laxmi Puja, Rabindra Jayanti and Independence Day is celebrated in a grand way here. Every year during winter a picnic is organized where the residents go out together for a day long outing. Apart from these, a very special festival is also organized by the lady residents of Srijan Midlands namely Anandamela wherein the ladies prepare various finger licking delicacies and the residents buy these delicious delicacies from them. Srijan Midlands provides facilities that are par excellence as follows.